BBQ Roaster – Scott's Party Rental, Inc. 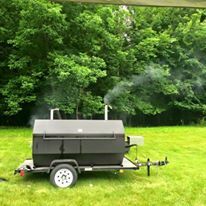 This BBQ Roaster was custom made for Scott’s Party Rental. This roaster can hold up to 150 lbs max. This item can be picked up at our warehouse, or delivered. It requires a 1 7/8″ ball hitch.